Explore the secrets of the Nile with Pharaoh’s Luck, a 5-reel slot game with hidden scatter symbols to boost your treasure. 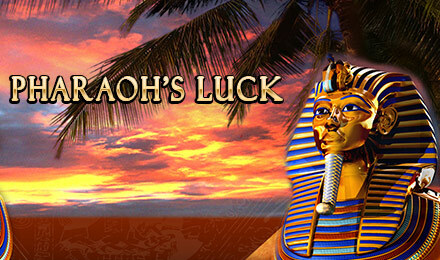 Pharaoh’s Luck Slots is an Egyptian themed game which takes players on a fantasy adventure towards a jackpot win. The slot machine has five reels and twenty five paylines and utilising classic Egyptian styled symbols. The symbols include ankhs, Egyptian Eyes and the standard K, Q, J, 10 and 9 symbols. This slot features Wilds, Scatters and bonuses. The Wild symbol is the Pyramid which can be substituted in for all others except Scatters. When the Pyramid is on any winning payline the win will also be doubled. The Scatter symbol is the Mask and this triggers the feature bonus round when you line up between three and five across your reels. The feature bonus in this round is a Pick Me special whereby you can pick three masks from a screen full and reveal a coin prize. Any Mask prize will be credited on top of your original triggering bet. Pharaoh’s Luck offers players the chance to enjoy an adventurous theme and an enjoyable bonus feature.